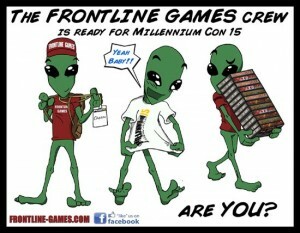 Frontline Games is headed to MillenniumCon15. Are you? If so, stop by and say, "Hello." All my exes live in Texas, so I won't be making the trip. Come join us this weekend at MillenniumCon 15 in Round Rock, Texas, where we will be running demos of some of our most popular games including Frontline Command WWII, Alien Attack!, and Zombie Daze! You can also get a sneak peek at our much-anticipated Sci-Fi miniature game, Black-Hart. If you've been curious about our games and would like to try them out or if you're already a die-hard fan, you won't want to miss out on the fun. See you there!